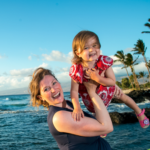 Did a family and maternity session at Old Airport Beach Park on the Big Island of Hawaii. There is a small bay at the end of the park that is a little more secluded and offers more privacy for a maternity session. We did a blend of natural light and flash light giving a couple different looks. The daughter had a mermaid outfit that we did some shots with.